High performance static T8 fixture for recessed applications. Suitable for damp locations. Uses 2 bulbs, 31 watts, 24". UL Listed. 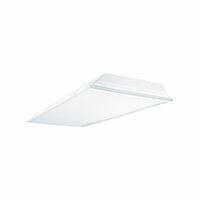 Cooper Lighting Troffer Light, Recessed, Series: 2GR8, 120 V, T8 Lamp, 32 W Lamp, 4 Lamps, 3100 lumens, Electronic Ballast, Acrylic Lens, 4 ft Overall Length, 2 ft Overall Width, Steel Plates, Baked Enamel, White, UL Listed, IBEW Labeled, For Residential Applications For use with T8 lamps, electronic ballasts and sockets. Smooth hemmed sides and inward formed end flanges for safe handling. Lighter weight fixture. Standard steel door frame with precision flush mitered corners, allows easy lens replacement without frame disassembly (for lenses up to .156" thick). Powder-painted, steel latches. Mechanical light seal requires no foam gasketing. Integral T-bar clips secure fixture to T-bar system. Housing formed from cold-rolled steel. Acrylic shielding material UV stabilized. No asbestos is used in this product. Suitable for damp locations. UL Listed.